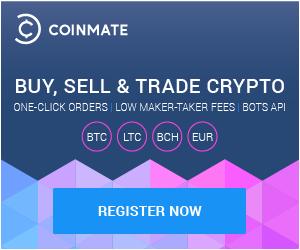 Once you have registered with CoinMate.io, you are able to begin trading bitcoin on the exchange which is priced in US Dollars. If you would like to deposit or withdraw money, and have completed verification successfully, you can begin to deposit and withdraw money. The exchange does not charge for deposits or withdrawals. As a European exchange, we accept SEPA transfers in Euro, Czech Koruna and Polish Zloty. 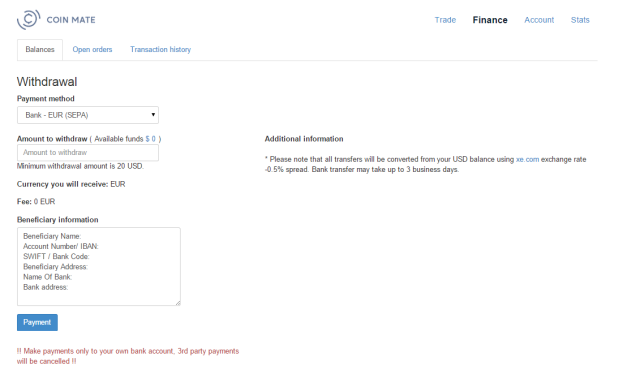 Once you are logged in, go to the Finances page and select to deposit or withdraw money. To deposit money, click on deposit, and then select from one of the currencies we support. You will then be provided with bank details. Make a lodgement to the exchange from your bank. This usually takes one to two working days. Once your payment has been received in our account, we will convert this into dollars using the xe.com exchange rate for your currency, with a 0.5% margin applied. Once this is credited to your account, you can then trade on the exchange. There is no minimum deposit amount. To withdraw money, click on withdraw, and then select from one of the currencies we support. There is a minimum withdrawal of $20. Enter the amount in dollars you would like to withdraw, and then enter in your bank details. Please note, that withdrawals to third party accounts unrelated to the verified user will be cancelled, with the funds being put back onto your account. We process withdrawals several times a day, and usually it takes between one and two working days, but withdrawals made early in the day can often be received on the same day.